ReactOS is a free software reimplementation of the Windows XP architecture. Earlier efforts existed to run KDE 3 on ReactOS using Cygwin, but the latest successes use native KDE 4 Windows applications as produced by the KDE on Windows project. 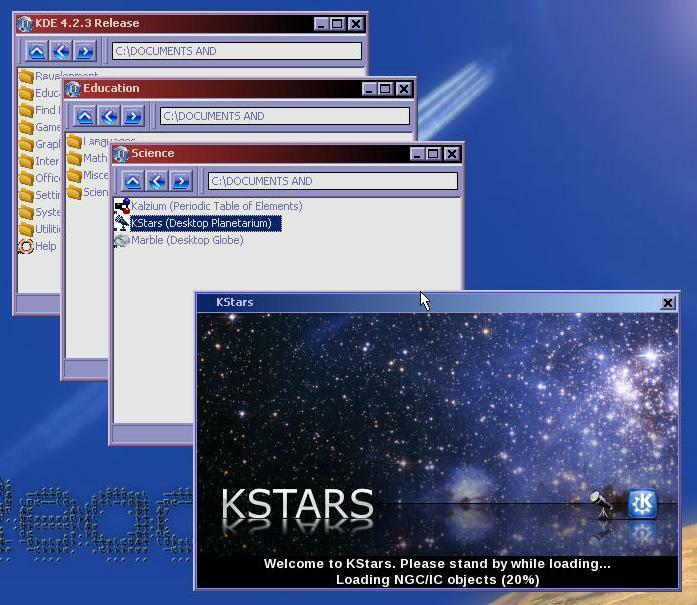 Some applications like KStars, Kolourpaint, KCalc and KGeography are running already on ReactOS (see the screenshots, reproduced with the permission of Davy Bartoloni). The KDE on Windows project packages many more applications however, including Amarok, Okular and Gwenview. When both the KDE on Windows and ReactOS projects mature these applications will also become available. ReactOS is still in alpha stage and not recommended for everyday use. Attempting to use the latest KDE Windows installer on ReactOS resulted in a blue screen of death and so this demonstration of running KDE applications required compiling them on Windows and then transferring the binaries to ReactOS. Despite such limitations, this is yet another platform beginning to gain KDE support and in future it may provide a viable free software alternative for trying out the Windows versions of KDE applications. In the meantime it brings a little KDE goodness to even more new users. I'm really looking forward to stable releases of ReactOS, and KDE on ReactOS. Good luck to all devs!